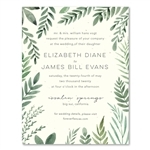 Give your wedding stationery a dreamy and romantic feel with these tender branches of the tree of life. This powerful design from ForeverFiances offers a beautiful glimpse of nature in a chic, eternal way. Printing on handmade seeded paper, plant-able into colorful wildflowers. Matching invitations, response cards, insert cards, menus, programs, place cards, and thank you cards are also available.